To meet the needs of the students and society, this scheme has been developed to equip students with the specialized skills in product design and development, marketing, process control and optimization in complex organizations and businesses, in a global context. An integrative and problem-based teaching and learning approach is adopted in the scheme, helping students to develop their engineering knowledge as well as their communication, team-playing, management and self-learning skills. Graduates are able to play leading roles in industry by virtue of their well-balanced education and practical training. The skills learnt not only improve the systems of today, but also create better ones for tomorrow. Students admitted into the scheme will study the common curriculum for the first one and a half years. They are then free to make their programme choices (one out of two programmes). Technological advancements have been driving industries to perform smarter and faster each day. Product and industrial engineering is no exception. Following the next Industrial Revolution (Industry 4.0), modern technologies are paving the way for cleaner, smarter, and more efficient processes in both industrial and service sectors without impairing their high-quality levels. The Internet of Things (IoT) with numerous connected smart devices locally and/or globally are drastically transforming Industrial engineering with new capabilities that facilitate both local and global enterprises to achieve timely remote process control and monitoring, real-time analytics of the vast amount of vital data for decision making, as well as embedding data smartness into products and services over the cloud. 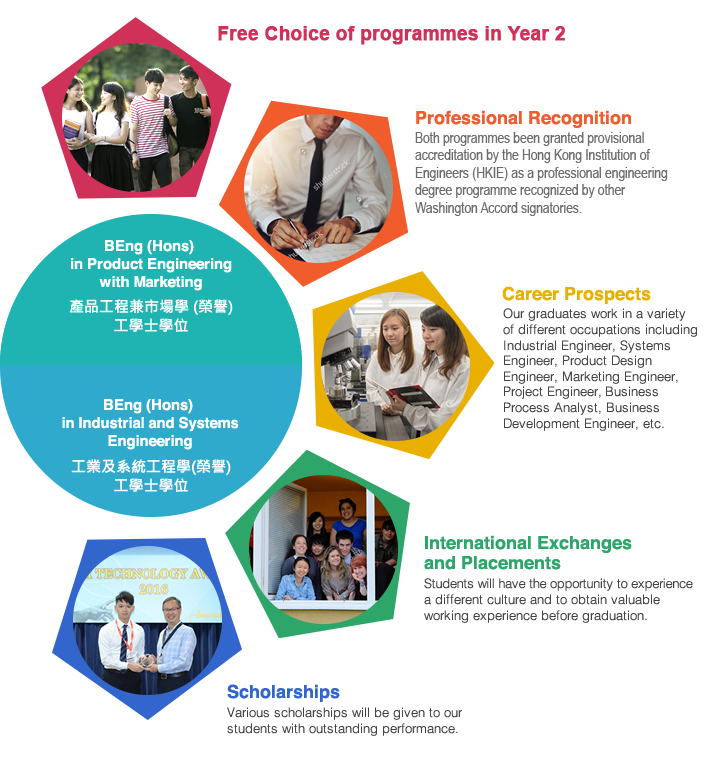 The scheme aims to provide the student with fundamental knowledge and skills in product and industrial engineering, including engineering economics, quality engineering, engineering science and mathematics, engineering communication and information technology, so as to enable her/him to have a solid foundation and flexibility to pursue a bachelor degree, either in product engineering with marketing or industrial and systems engineering, after the first and a half year of study. Industrial and Systems Engineering (ISE) is a professional discipline that focuses on developing and implementing optimal solutions from a system-level perspective and bridges the gap between management and operations. It has a strong focus on operational processes, which forms the backbone of all industrial and service organizations. This involves people, technology, quality, finance, information, and environmental issues. The main role of Industrial and Systems Engineers is to organize and streamline operational procedures, increase efficiency, reduce operating costs, increase customer satisfaction, enhance safety and improve overall system performance in all areas such as factories, Disneyland queues, rapid prototyping, etc. The ultimate objective is to provide leadership in the design of integrated industrial and commercial systems for the advancement and well-being of the community. ISE is different from other traditional engineering disciplines whereby knowledge and skills are applied to specific areas. In contrast, ISE provides graduates with much many flexible career paths so as to work in a variety of organizations in both the industrial and commercial sectors. Aims of the programme To produce engineers and professionals who are competent in the design, improvement, and installation of integrated systems of people, technology, information and economics for the best of both worlds: engineering and business, for optimization in cost, efficiency, effectiveness, quality, safety, and reliability. Professional Recognition The programme has been granted provisional accreditation by the Hong Kong Institution of Engineers (HKIE) as a professional engineering degree programme recognized by other Washington Accord signatories. The Washington Accord is an international agreement between bodies responsible for accrediting engineering degree programmes. Currently, it has 18 signatories, including the United States, the United Kingdom, Australia, Canada, Japan, Korea, Singapore, Taiwan, Malaysia and New Zealand. Product Engineering is about the design and application of manufacturing techniques to produce a specific product. It involves planning in the use of resources, coordination of productions processes, and systems, application of methods, equipment, tooling as well as cost control techniques. It takes care of the entire product lifecycle, starting from the idea being conceived in the innovation phase to the deployment and commercialization. With globalization, there is demand for better quality products and services. Many Hong Kong manufacturers have been switching from low-cost original equipment manufacturers (OEMs) to high added-value original design manufacturers (ODMs), and even to original brand manufacturers (OBMs) in order to maintain their competitiveness and maximize their profit margins. This has led to a substantial demand for professionals to design and develop new products such as domestic electrical appliances, medical devices, healthcare products, electronic consumer products, audio/visual products, green products, power tools and automobile components.